A lyrical World War Two drama, The Thin Red Line explores the psychology of soldierhood in the context of the Guadalcanal campaign. The film mixes intense battle action with slow moving, narration-driven introspection scenes to create a unique but not always successful experience. A collection of soldiers are thrust into battle when the United States mounts an invasion of Guadalcanal to halt the Japanese plans to control the south Pacific. 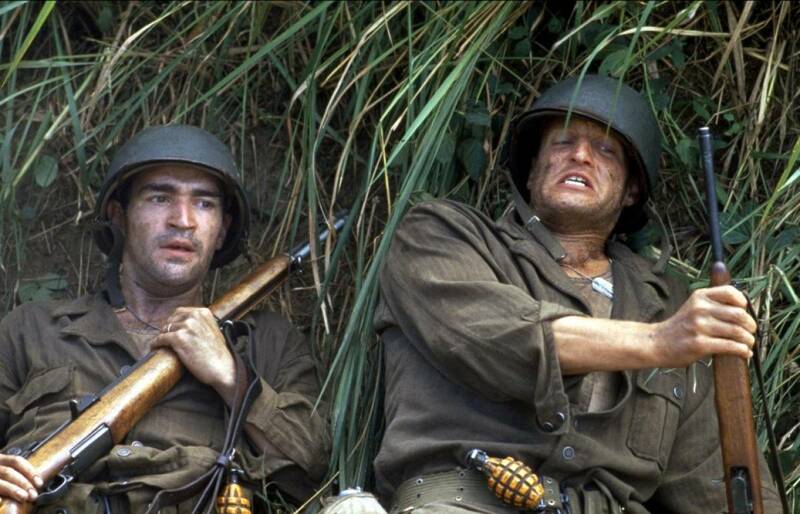 The men include Witt (Jim Caviezel), who is thoughtful and philosophical about the war's purpose and always one step away from wandering off on unauthorized leave; Welch (Sean Penn) a no-nonsense down to earth soldier's soldier; and Staros (Elias Koteas), a Captain who cares about his men, perhaps too much. The hard-driving Lieutenant Colonel Tall (Nick Nolte) is the local commander, and he is eager to make up for lost time after being passed over for promotions throughout his career. 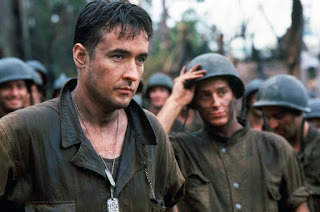 Captain Gaff (John Cusack) is Tall's loyal second-in-command. The soldiers engage in fierce combat to dislodge the Japanese from a strategic hilltop, and then push on towards the Japanese rear positions. But territory is gained at a high cost, and each man has to deal with the chaos of war in his own way. At times, The Thin Red Line represents war as wall paper with a soundtrack of pensive poetry. The visuals may be impressive, and the narration a morose and thoughtful reflection of soldiers' thoughts, but the pace, particularly in the opening and closing 45 minutes, is as close to watching paint dry as a movie can get. 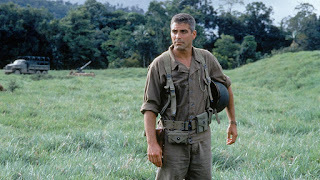 Terrence Malick directs with his trademark disregard for what may be popular, opting instead to focus on the beauty of a Pacific paradise being invaded by the ugliness of war. With a running time of close to three hours, the film occasionally rewards patience, but also tests it to the limit. Malick matches Spielberg's Saving Private Ryan (also from 1998) in capturing the agony and ecstasy of war, the pulsating kill-or-be-killed calculus quickly disposing of human pauses once the battle is joined. This is a war film that is not afraid to show fighting men as confused, terrified and error-prone. When heroes do step forward, they do stand out, although in their rush to claim glory, commanders like Tall also find ways to cheapen the achievements earned on the battlefield. Less successful is the attempt to humanize the soldiers. Despite the mammoth running length, there are just too many individuals cluttering up the front lines, and too many actors given too little to do. With Malick endlessly focusing his cameras on wildlife and still life, the soldiers are shortchanged into insignificance. The likes of Adrien Brody, Woody Harrelson, John C. Reilly and Jared Leto are reduced to little more than extras in the context of a three hour film. John Travolta and George Clooney are each on screen for about 30 seconds. Nick Nolte, Jim Caviezel, Sean Penn and, to lesser extent, John Cusack are treated marginally better, but the film is definitely stained with the mark of name actors slipped into meaningless roles to try and salvage box office. The movie offers up two half-hearted character conflict points, and they are both overdrawn. Tall and Staros clash about battle tactics, with Staros refusing to obey orders that would have put his men in harm's way. The stand-off between the two men is prolonged to the point of exhaustion. Meanwhile, in a bizarre chase for dramatic tension that goes nowhere, the loyal Gaff dares to demand from Tall that the men be supplied with water as they fight. Ponderously spouted narration about the futility of war does not make up for the lack of genuine narrative substance. Flawed as it is, The Thin Red Line is a worthwhile and cerebral addition to the catalogue of war epics that care more about damage caused than territory gained. The film may choose aesthetics over content, but it never loses sight of the losses on all sides.